Painted Mountain Ornamental Corn | Gurney's Seed & Nursery Co. This hardy strain has descended from 70 varieties of native corn rescued from Indians and homesteaders who lived in some of the harshest climates of the U.S. and Canada. Tolerant to heat, drought, high winds and cold nights. Makes superb flour, hominy and parched corn. Can be eaten fresh when young. A striking ornamental, with more beautiful colors than any variety we've seen. 90 DAYS. SpacingPlant spacing 8 - 10 inches apart. Row spacing 30 - 36 inches. FruitMulti-color. Ear length is 6 - 7 inches. Soil RequirementsHigh fertility and deep, well-drained fertile soil with a pH between 6.0 - 6.8. Seed CountApprooximately 50 seeds per packet. PollinatorTo promote complete pollination, plant corn in blocks instead of one long row. 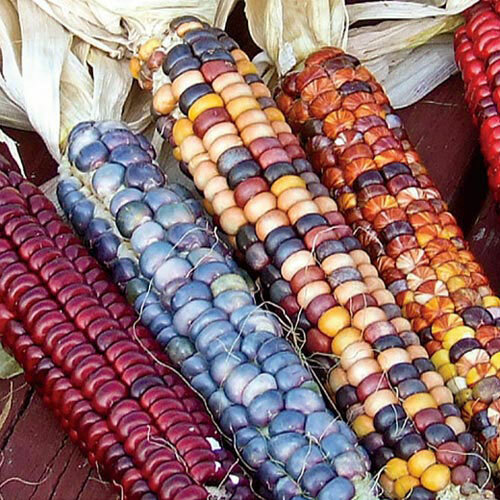 CommentsMulti-colored kernels vary from ear to ear. Ears are 6 - 7 inches long and are good for both decoration and milling. DepthPlant seeds 1 inch deep.